During Doctor Who‘s television run in the 1980s, the Doctor, in his fifth and sixth incarnations, had a lot of activities on or around Gallifrey. He managed to save the Time Lords not once but twice from what would have been some very embarrassing events caused by their own kind. He was even made President of Gallifrey for his troubles, after which he decided to leg it rather than take on the responsibility. His people later put him on trial for interference on a large scale. Not really a nice thing to do in hindsight. Capricious folk, these Time Lords. The Sixth Doctor, at the start of his infamous trial, claims that he is the President of Gallifrey and therefore cannot be put in this situation. The court begs to differ, informing him that as he decided to avoid his responsibilities as President, he was replaced. Something that’s nice and legal on Gallifrey, apparently. 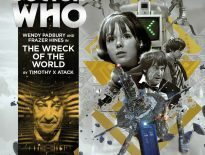 As closing a gap in continuity goes, this reviewer had no problem with that throwaway line filling in certain gaps in the Doctor’s personal timeline. It was nice and clean and helped to answer a few questions. But with Big Finish’s Time in Office, listeners are offered a side step from that official line. Not so much a change in continuity as an extension on it. These stories cover the time the Doctor came home to stay for a bit, and when, in his Fifth incarnation (played, of course, by Peter Davison), he ruled as President of Gallifrey. With mixed results. There’s no need to worry here; this is a fine set of stories – four separate tales with a loose link to a fun conclusion. For a story set on the Doctor’s home world, with Leela (Louise Jameson) thrown in as well, there’s surprisingly little baggage to deal with so newer listeners can get involved as well. From the Doctor’s initial reluctance to take office to his final adventure in… well, that would be telling, but the endgame certainly bears a small similarity to a plot device of an Eighth Doctor story from the pages of the Doctor Who Magazine comic strip in the late 1990s. Spot it if you can. The Doctor’s wanderings around old haunts, as well as his introduction of new policies, are certainly fun, as is Tegan’s (Janet Fielding) reaction to Time Lord hierarchy and the job role she eventually adopts, which works well with her personality. Those expecting something incredibly dramatic should leave their expectations at the door – this is a romp, through and through. There are some lovely little moments to enjoy between the Doctor and Leela plus an enjoyable look at other Time Lords trying to emulate the Doctor’s sense of adventure. But this is no End Of Time style story; this takes the established Gallifrey viewers were used to in the 1980s and gives it a good solid polish. From the comedy of episode one to the quite charming ending of episode four, this is a story of Gallifrey long before the Time War changed who the Time Lords essentially were. It all adds up to a splendid caper on the Doctor’s home world. 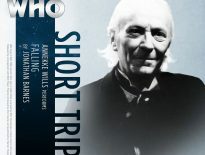 Whilst this may not be a story that everyone needed, it certainly bears weight when played out: it’s a nice trip home for the Doctor and, given the fact that later incarnations had a terrible time when visiting Gallifrey, it’s probably just what needed to be ordered at this time. Time in Office is out now from Big Finish.